A total of 33 entertaining stories about everyday themes written using a wide range of vocabulary and diverse grammar structures. Learn 3,000+ Spanish vocabulary words including some colloquial terms spoken in everyday Spanish conversations. 3 formats available: PDF, EPUB, and MOBI. Get your copy for only US$29.90 US$24.90 (or the equivalent in your currency). 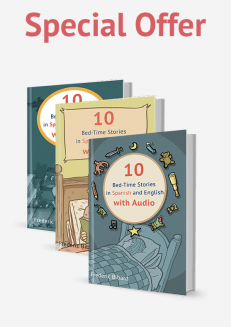 A total of 33 entertaining stories about everyday themes: short enough to hold your attention (1,500 words in length), but long enough to make you feel a sense of accomplishment and progress after finishing each one. Learn 3,000+ new Spanish vocabulary items, including some colloquial terms spoken in everyday Spanish conversations. Free audio to improve your listening skills in Spanish. The book comes with a Spanish and English glossary within the stories themselves, so there will be no need for a dictionary to help you with words you don’t understand. No need to go back and forth to translate or look up words you don’t understand. With the help of the audio, you can give your listening skills a boost as well as practice your pronunciation. 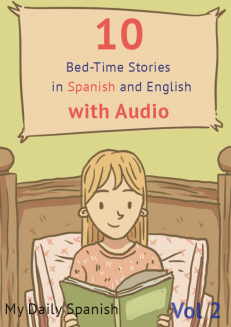 Recorded by a professional voice talent from Madrid, Spain, the stories are narrated using a standard Spanish accent and slightly slower speed than how actual Spanish people speak. These learning aids are embedded directly into the material to ensure a smooth flow of learning. This book contains a total of ten short stories that revolve around useful daily themes such as movies, family, daily routine, vacations, physical descriptions, and so much more! Is This E-Book Bundle for You? Looking for e-books with audio that you can listen to everywhere. 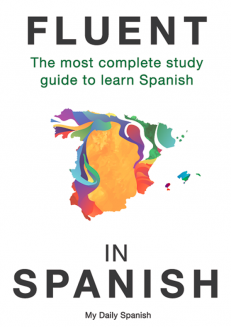 “I bought this book because I am currently living in Spain and NEED to improve my Spanish skills! I like how this book has simple stories that aren’t for little kids but also aren’t so difficult that I am using Google Translate for every other word. I’ve tried reading Harry Potter in Spanish but I don’t think I will really need to know how to say “butterbeer” or any of the spells in my day-to-day life. Ready to start learning Spanish? Grab your copy now! I’ve been looking at numerous Spanish practice books and was quite impressed by this one. someone in the intermediate/low range. The stories were fun and the audio was set at a good pace. Honestly there isn’t much to critique about this other than I wish the audio used different voices and accents. All in all, this would be good practice for people who have a little bit of Spanish already under their belt. I liked the methodology of the book because the stories besides interesting are divided into paragraphs and each has a small vocabulary that helps in understanding the story. And this combination with audio really makes a big difference in the assimilation of new words from the language. And a small questionnaire at the end of each story makes the content really more easy of learn. If you want to get a deep knowledge in the Spanish language, surely, this combo will be your best investment! I really enjoyed these books, including the audio. The stories in the beginner books are broken down into small written chunks, after which key vocabulary words and phrases are defined to help the reader better understand the passage. 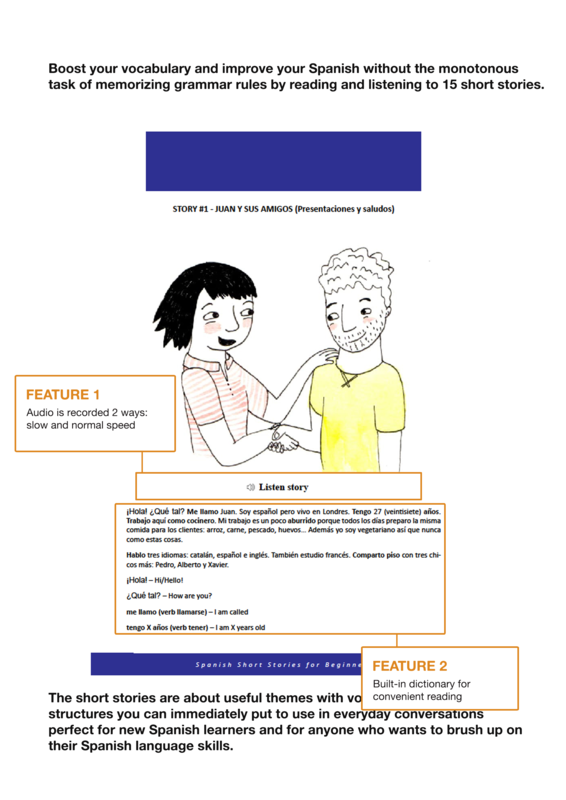 In addition to the written words, there are also audio versions of the stories, so you can read as you listen along. There are three book/audiobook combinations in this bundle, so there is plenty of material to go over. It has been several years since my last Spanish class, so I chose the beginner option to start as a refresher. I highly recommend! It was a great way to ease myself back into the language. The book is well organized and has a nice and intuitive look that suits very well the audios that comes in complement, which helps a lot when studying and memorize the content since everything is at hand! The recordings are of excellent quality and the voice of the narrator is pleasant besides having good Spanish. 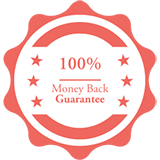 It can taken anywhere, on any device, even printed, because the books come in various formats and this is really good, makes your investment worthwhile. I totally recommend! 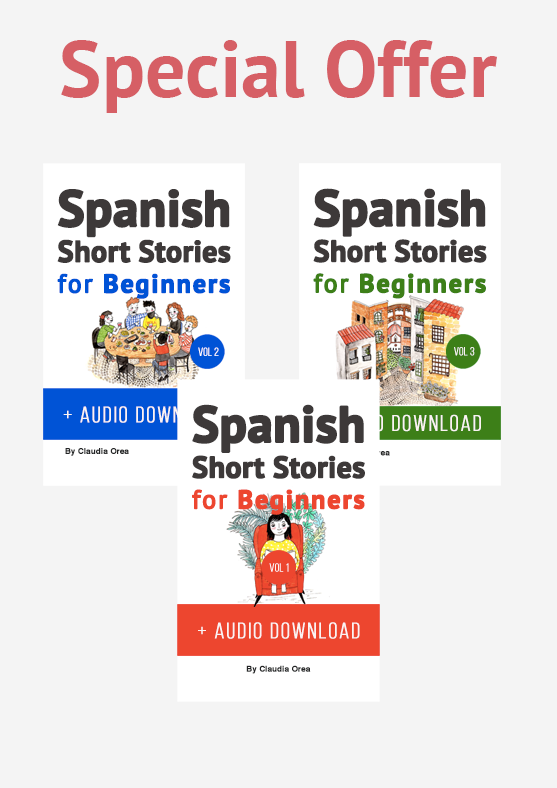 I liked these ebooks, people who are interested to learn spanish should read it. 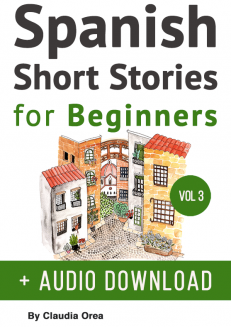 This book contains 11 short stories about daily life, very easy to understand. Also the audio is very helpful, it shows you how to pronounce the words correctly. I give this book 5 stars since it makes you learn spanish in a very simple way. I was attracted to the book because I can learn from stories that are similar to real experiences and topics. It really helped me grow in the Spanish vocabulary, with new words that I did not relate. 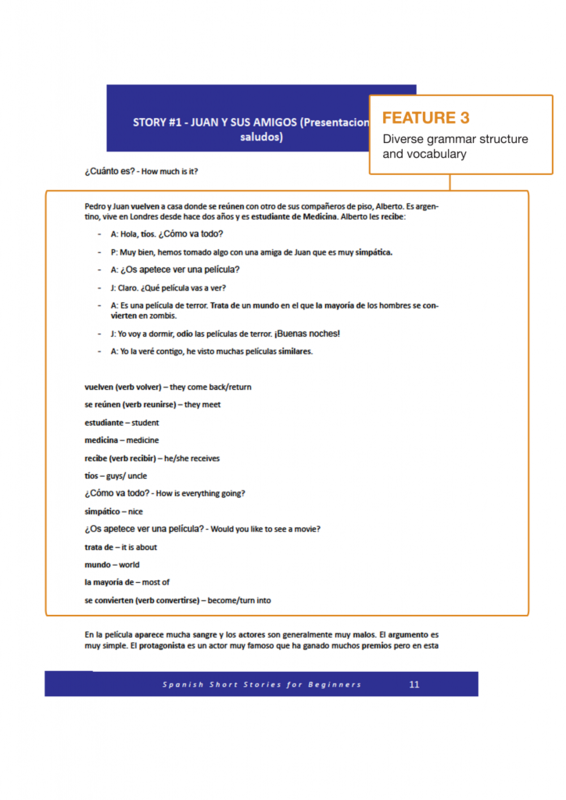 It’s structure and order facilitated the learning and retention of words, especially the reference of verbs, for me it is the most difficult of Spanish. In my opinion the vocabulary at the end of each chapter is enough and there is no need for vocabulary in the middle of the story (bold it is fine). The book (Volume 2) is more extensive in their stories, I liked it more than volume 1. I learned full words and phrases. The summaries helped me to make sure if I understood the stories. My favorite was “The Muscular Memory and the Frequency of Training”. I think my level of Spanish has increased and my understanding in Spanish too. This makes me feel more secure when speaking Spanish. I recommend the book widely. This book (Volume 3) goes deeper than the previous ones and I had to look for some words on my own but it was interesting to improve my vocabulary. I suppose there is an error in the title of Text 10 – Case (“Casa” is the right word). Having read these books opens doors and opportunities in the world to improve my Spanish. I will continue reading books by this author. 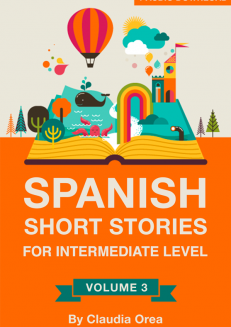 This bundle is great for students learning (or relearning) Spanish. 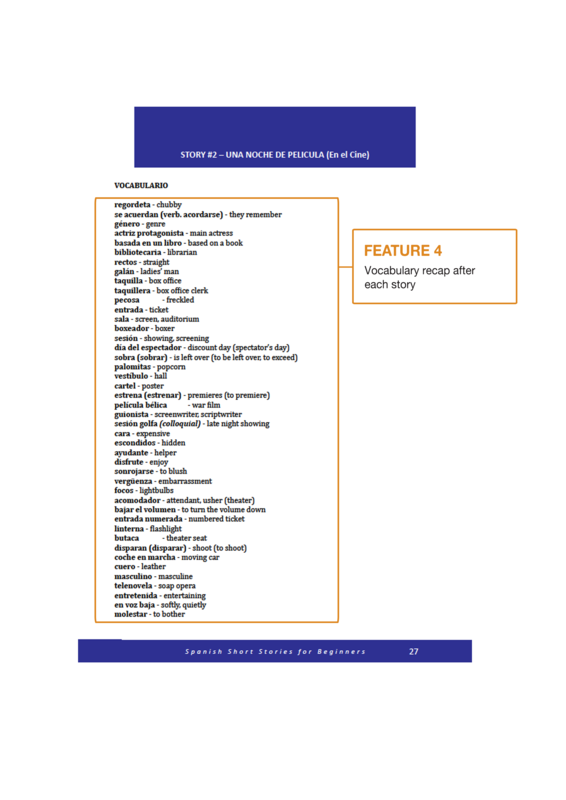 It’s perfect to practice listening skills and pick up on new vocabulary as all of the terms are bolded and listed in a glossary below each section, plus there is plenty of material to go through. These are similar to books I used in high school Spanish and ideal for beginners. Having the terms bolded and listed is useful when you’re listening to the audio and you don’t recognize a phrase. I found the audio pleasant to listen to and timed well enough that you could easily follow along. The stories are nice for students because they aren’t really children’s stories, but stories about everyday events and you’ll find useful phrases to use in casual conversation. The questions at the end of the story are perfect for classes, and you’ll also find answers so you can check your work. 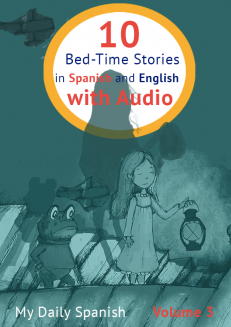 I personally loved to read these Stories, The stories are simple and casual, they are a perfect example of Everyday Conversation, also the Audios are clear which help a lot with oral communication and get used to listening words in Spanish. This Bundle has everyday life experience and fun stories, I enjoyed reading them. The recordings are a pleasure to hear. the stories are short and practical. the audio is easy understandable. as a starter spanish , i find that bundle pretty useful. These books are essential to people who want to learn Spanish over the summer. Being a student in AP Spanish, these books are my lifesaver. I learned more complex vocabulary and improved my comprehension of Spanish short stories, which is important for the AP Exam. With audio, the story becomes even more enjoyable and helps me pronounce Spanish words the right way. Also, the glossary in each volume helps me look back at words I did not understand and quiz my understanding of more advanced texts. These books are a must if you want to excel in Spanish. 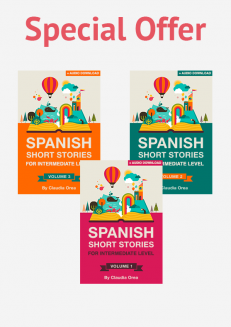 Well, this is a really great bundle, all the books count on witch easy and funny stories, making that a smooth experience while learning Spanish. The storyteller has an amazing pronunciation, saying everthing perfect and calm. I recommend at all this bundle! I enjoyed reading this book. I’ve always wanted to better my Spanish. My mother is from Honduras and my father is from here, so I always knew how to speak Spanish, but just recently fell back and this was almost like a refresher course for me. I think beginners and even advanced Spanish speakers will enjoy this book too. I liked how there was the English to important words after each story. Overall this was a great book and I would definitely purchase more from this collection. I studied Spanish in high school but lost it over the years, I had wanted to start learning it again so I downloaded apps and videos and none of it stuck. Until I downloaded these books. I was impressed at how much I learned, understood and was able to speak fluently. My favorite part of the book is where they state the Spanish word then the English word so it’s so simple to understand and you learn really fast and easy. 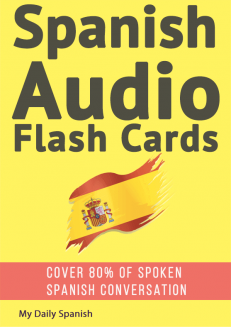 Each book included audio tracks, which helped me to learn Spanish accents, correct pronunciations and slangs so I could really speak and understand the language. The stories are entertaining and kept my attention unlike many books I have seen before that just had me practice boring vocabulary. I definitely recommend these books to anyone wanting to learn Spanish fast and easy, they definitely helped me. The bundle of books offered here are great to use to further your understanding of the Spanish language. Short stores that are easily read quickly and smoothly are hard to come by. Kudos! I like the audio narrator’s voice and Spanish accent. 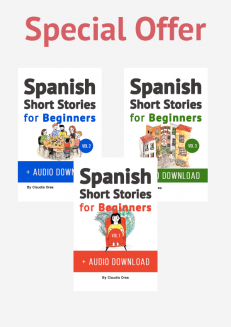 I have the beginner’s bundle and it a great way for me to refresh and get a re-feel for the Spanish language. The Stories are engaging and with the aid of audio and PDF read alongs, I learned so much and had fun in the process. I think this is a great book for adults that want to learn Spanish in a non-elementary way. As I was reading the book I found it very helpful to have the glossary provided instead of having to look up every other word/phrase myself. The one thing I always struggled with was understanding what was being spoken simply because it was too fast for me to process. Listening to the speaker not speed through everything super fast gave me a chance to not only process what I was hearing but actually enjoy it as well. This is an excellent book for effective learning. This bundle of books is perfect for anyone in the beginning stages of learning Spanish. The variety of stories helps the learner understand new vocabulary in real-life context, without the narrator speaking too quickly. You can quiz yourself on the stories, and review an English summary to make sure you’ve understood the text. It is a perfect resource and great investment. I have the beginner’s bundle and it’s a great way for me to refresh and get a re-feel for the Spanish language. The Stories are engaging and with the aid of audio and PDF read alongs, I learned so much and had fun in the process. As a beginner I feel these books are perfect. I like the fact that there is a glossary with words to help me understand and test myself.